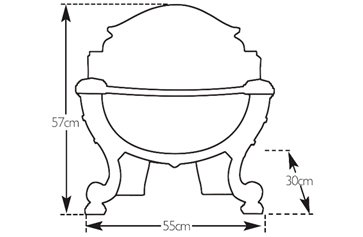 The Balmoral is a reproduction of a Cast Iron Fire Basket. It is a stunning design with a highlight polish finish. Also available with an Ashpan Cover that perfectly fits the Balmoral Fire Basket. Available with a gas insert and coals to give a real fire effect. The Balmoral is a reproduction of a Cast Iron Fire Basket. It is a stunning design with a highlight polish finish.